Kanye West at the Grammys. Speaking of stages Kanye rushed at awards shows, he also announced plans to hit the studio with onetime mortal enemy Taylor Swift, saying she told him he should’ve gone onstage as soon as he returned to his seat. 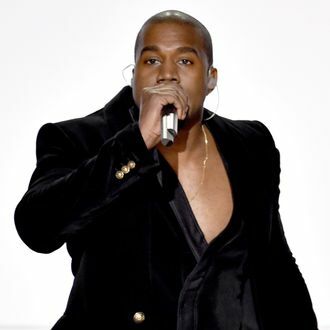 Asked if he’d return to the Grammys next year, Kanye said not unless major changes in its voting system happen. “They’re like a broke clock. They’re only right like twice a day,” he said, proving he really is a dad.